The new 200L beam had a bluish tone my old 3W a more yellow one. The 200L did not put as much light as I though it would do. I was not very happy but the same I went to sleep thinking I would go for a ride next night when I came back from work. 6pm the next day I was out the door with both lights on my bike. On the way to the spot I had in mind for shooting some tests photos I switched between light engines and was not able to ride comfortably with the new 200L The beam was to narrow for descending and riding unfamiliar roads. Yes it put light further than the 3W but the light beam was not as usable for me as the good old 3W. With the 3W, on "high", I have always been able to descend at almost normal speeds on unfamiliar roads. BTW, I complement this light with a Princeton EOS headlamp, another great light. 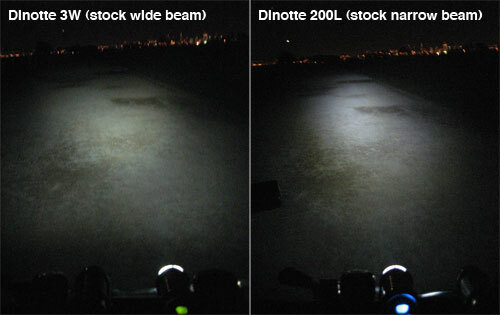 The stock beam on the Dinotte 200L does not spread much "love" to the sides of the road where I need it to aid me reading the road. If I used the two lights, 200L and 3W at the same time, there was a lot of light but my point was to get a single handlebar light, plus that was way too much light for my taste; yes there is such a thing for me. When riding a bike I don't want to feel I am driving a car with powerful lights, the same way I don't like motorcycle like suspensionon on my bike. I like my bicycle experience a little raw and old fashioned. Came home thinking I would just send the new 200L back and get a refund but then I decided to give the Dinotte 200L another chance, I would swap lenses between the two lights and do another test ride the next day. When I undid the five frontal screws of both lights I noticed both lenses were almost identical, still I swapped them and did another hallway test, same result as before. Went for a ride, yep, the beam pattern did not change at all in neither light, something else was at play here, LED optics? I say yes. Yet I decided I would give the new light another chance so I fired an email to Dinotte asking if all 200Ls came with the same lens and if it was possible to get a wide beam lens like the one that came with my old 3W. Next morning I had a repply, they thought my 3W was really a 5W but more important, yes they had a wider lens. (however apparently all 200L come with the narrow lens) They sent me the lens at no charge. While I waited for the new lens I ran a battery burning-time test, indoors with the light mounted to the bike handlebar. Fully charged the same set of batteries where I get a little under 2 hours on high from the 3W and turned this 200L on high. After exactly 3:06 hours the light flickered signaling it was close to running out of juice. A full extra hour is a good deal of extra time, something to consider. Three days later I was swapping lenses yet one more time. Bingo! 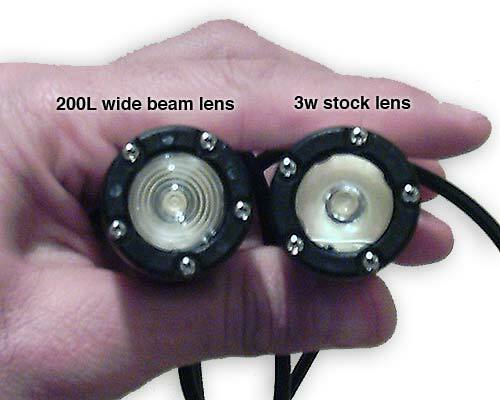 the new lens spread a wider beam similar to the good old 3W (I still think is a 3W) but it seemed brighter. A test ride confirmed the hallway observations. The 200L was now Carlos'-night-ride worthy, nice beam and brighter. I was a happy camper. Sorry no shots of the new wider beam 200L but imagine the beam shot of the 3W but brighter. Are one extra hour of burning time on high and a brighter beam worth $105? In my case, yes. I will probably sell the old 3W so my total cost for the upgrade would be less. Also I don't use the high mode other than for descending so in medium power, where I spend ~80% of the time, I may get close to 6hours of light, even if I get 5 hours that would be great. On longer rides I use my dual battery pack so a single set of 8 AA batteries will last me a whole night; less batteries/weight to carry on those longer brevet events, great deal. Excellent review of the Dinotte, Carlos. I also read your write up on the "dual battery pack" and I enjoyed it a lot, so much that I might actually make one for my Dinotte 200L. However, I am new to modding battery pack so I am curious as to whether doubling the battery number (from 4 to 8) might overload the lighting unit (i.e. from 4*1.5V [6V] to 8*1.5V [12V]). Your advise is much appreciated before I mess up my 200L. Waiting for your next article.